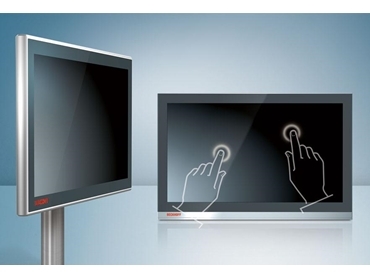 BECKHOFF Automation presents a new multi-touch panel series featuring multi-touch display and a contemporary device design. Designed for maximum flexibility, the new Beckhoff CP2xxx and CP3xxx control panels and panel PCs feature aluminium and stainless steel panels for robustness, making them suitable for use in harsh industrial conditions. Widescreen panels in various sizes and resolutions are available in addition to the classic display sizes in 4:3 format. The new widescreen display sizes include 7-inch with a resolution of 800 x 480, 15.6-inch with 1366 x 768, 18.5-inch with 1366 x 768 and 24-inch with the full HD resolution of 1920 x 1080. Display sizes in the 4:3 format include 12-inch with 800 x 600, 15-inch with 1024 x 768 and 19-inch with 1280 x 1024. The new panel series also offers numerous advantages to single-touch users such as an optimised price-performance ratio with savings of up to 28% compared to previous devices. Multi-finger touch screens are already popular thanks to smartphones and Windows 7. Beckhoff has introduced the CP2xxx and CP3xxx control panels to make the multi-touch technology available for industrial applications. The completely redesigned multi-touch panels enable new, innovative visualisation concepts with intuitive operation and combine elegance with a robust design. The new panel series also ensures long-term availability and high temperature stability. Customer-specific adaptations for design, key extensions or RFID increase the degree of flexibility of the multi-touch panels.